When I take on new clients, I have them write me a food journal when they start their journey to a healthier version of themselves. What I constantly see is fast food! I ask them why they decided to get a cheese burger instead of bringing a meal with them. It is always the same reason… “O I was in a hurry”. With today’s society everyone is on the run and really don’t have the time to meal prep. This is where Protein Shakes come in! You should always try to plan your meals ahead. Sometimes life happens, with shaker cups it literally takes seconds to make a protein shake right before you leave the house. You’ll actually save time making a protein shake instead of waiting in line to get fast food. Now some might say, what if I am already out and about during my day and something happens that doesn’t allow me to get in my planned meal? Some people will use the excuse that protein shakes don’t taste good. So my next question is… “What tastes better, that swim suit in the summer or the short term satisfaction that you get from the cheeseburger?”. Protein shakes can be an acquired taste similar to drinking alcohol or coffee for the first time. try different brands, eventually you will find a flavor that you like that will become your go to! Sometimes people will even try to use the excuse that fast food is cheaper. This I laugh at! The meal is what? Eight Dollars? If you figure you eat fast food 3 days a week. 3 times 8 is 24. I don’t think I have ever spent over 25 dollars on a tub of protein. A tub of protein that goes for $25 will most likely have 30 servings in it. 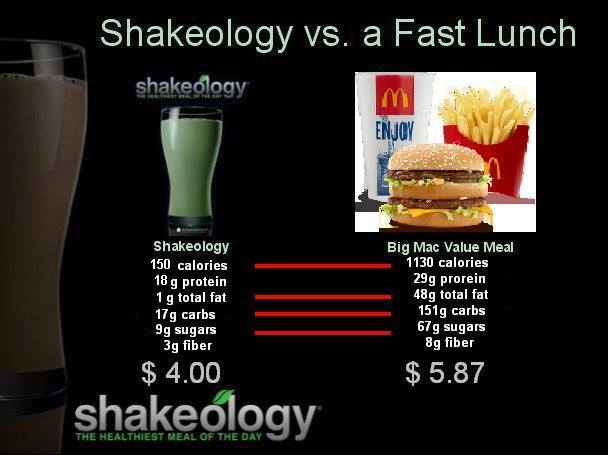 Even though I currently do not promote Shakeology sold by beach body, the picture below shows that even one of the more expensive protein brands is cheaper then Micky D’s! That’s less than $1 per shake! So there really is no excuse for eating fast food. Zero, Zilch, None! So I challenge anyone who still eats fast food on a regular basis to break the habit! Yes, believe it or not, you going to get fast food regularly is a habit. We need to break it! In doing so, you need to focus on it for at least a month. First by planning protein shakes into your meal plans for the times you usually get fast food. You have to be consciously aware of these thoughts, then take action to break the habit. I know you can do it! Let’s put Micky D’s out of business!